People are unable to get rid of from the glamorous and persuasive ads which tell you that if you are thirsty then go and grab a Soda drink because it is the only thing which could end your quench. That's all crap and a way to increase their sale by stupefying people with their persuasion power. As many studies showed the normal soda drinks are unhealthy and full of sugary many people use diet sodas as thirst quenchers. So if you thought diet soft drink was a healthy alternative to the regular, sugar-laden stuff, it might be time to go over choosing them. As a 10-year study has found a startling relationship between daily consumption of diet soft drinks and the size of your waistline. If you are adherent to diet sodas but even then you are getting fat then realize the reason of your obesity. The study came out with the fact that daily drinkers gained 8 centimeters of belly fat, compared to 2 centimeters for non-drinkers and 4.6 centimeters for occasional users, over the total study period. Many health conscious people prefer diet soft drinks over regular drinks, during diets or the time one eats heavy meals he always go for diet soft drink to complement its meal. 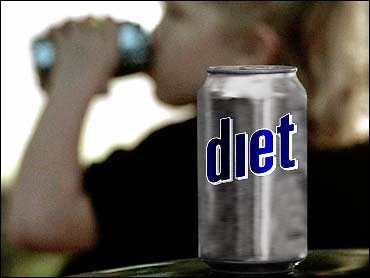 Diabetic patient think that diet soda can serve their craving but will be healthy as well, then this notion is proven wrong. Another reason for the damaging effect of diet sodas may be that artificial sweeteners aren't received in the same way by our bodies as natural sugars. "Regular sugar has caloric consequences," the study's principal author, Helen Hazuda, told Time magazine - namely, it triggers a feeling of fullness. "Your body is used to knowing that a sweet taste means you are ingesting energy in the form of calories that, if you don't burn them off, is going to convert to fat." But artificial sugar doesn't have the same effect and actually confuses the body's link between sweetness and satiation, Professor Hazuda added. After this study it is evident that one can get fat even if they use diet sodas. Daily or occasional drinkers should realize that increase in their waist line is due to this confusion which their body face while trying to digest artificial sweeteners. Nothing can replace benefits of water and real fresh juices. Prefer water while dinning out, prefer fresh juices or hot tea if you are serving any guest. The truth is unfolded, now this is our choice that we want to stay healthy or to obese. A group of scientists is trying to make safe diet sodas, but the truth is that nothing can replace the real pure food. So try it, stay away from junk and live healthy.